The National Portrait Gallery is inviting visitors to guess the inspiration behind its latest exhibition. 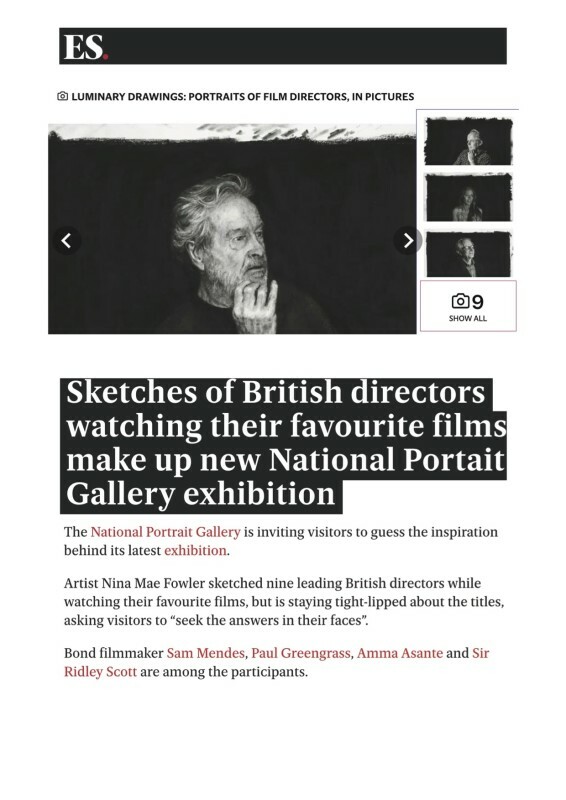 Artist Nina Mae Fowler sketched nine leading British directors while watching their favourite films, but is staying tight-lipped about the titles, asking visitors to “seek the answers in their faces”. Bond filmmaker Sam Mendes, Paul Greengrass, Amma Asante and Sir Ridley Scott are among the participants. Fowler, whose black-and-white sketches of Hollywood legends have gained her A-list fans including Jude Law, invited the directors to choose a film and sketched them while playing it on a projector. She said: “The beauty of these sittings was twofold. Firstly, the directors lost any sense of being watched or portrayed as they were too engrossed in the film. Secondly, we experienced the film together, which created conversation, laughter and an immediate bond between strangers. I want the viewer to wonder what film the directors are watching and to seek the answers in their faces. Scott, whose films include Blade Runner and Gladiator, has previously praised Australian comedy Muriel’s Wedding as his favourite film, while Greengrass is a confirmed fan of the Orson Welles classic Citizen Kane. Also pictured is actress-turned-director Amma Asante, whose list of favourite films includes Love Actually, and Wallace And Gromit creator Nick Park, who said his career was inspired by One Million Years BC with Raquel Welch. Scott admitted he “was not keen” on sitting for the portrait at first, but added: “She sent me a book on her work, and I was blown away. The gallery’s director Dr Nicholas Cullinan said the “unique commission” helped strengthen its “representation of the talent and diversity within the film industry in the UK today”. Luminary Drawings: Portraits of Film Directors by Nina Mae Fowler opens today and runs to October 1.